Good news everyone! The 2.3mm EL Wire from LED Montreal is now available in longer sections of 10 meters! This will give you more continuous length to allow you to decorate bigger things. Perfect for Halloween costumes or decorative highlights, the 10m EL wire is 2.3mm thick and features 3 modes: always on, slow flash and fast flash. It is offered in 7 colors: red, white, blue, orange, lime green, dark green and pink. For full portability the EL and can be powered by a battery pack of 2XAA batteries but for best results with a 10m wire, we strongly recommend upgrading to the extended 8XAA version (Note that the batteries are not included). The battery pack may make a slight hissing noise when in use. This is due to the DC inverter and rest assured that the product is safe for the user. The El wire can also be connected to a standard 120V outlet with the power adapter kit should you wish to use it for a permanent display. You can choose your powering option in the pull down menu on this page. 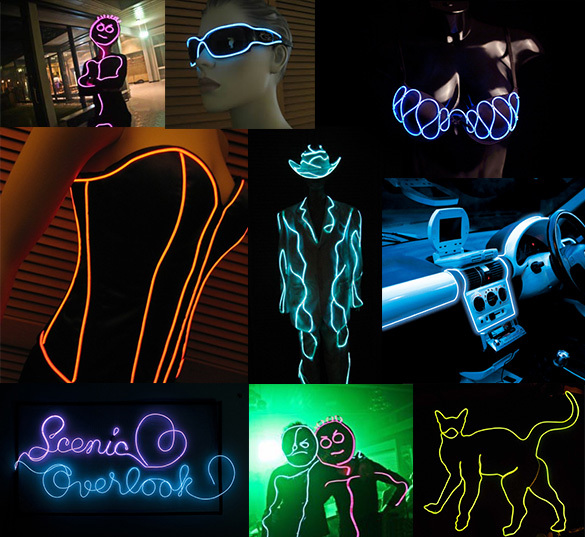 If you’re looking for different sizes or wire diameters, LED Montreal offers more EL wire options such as 1m 2.3mm EL Wire, 3m 2.3mm EL Wire and 3m 5mm El Wire.